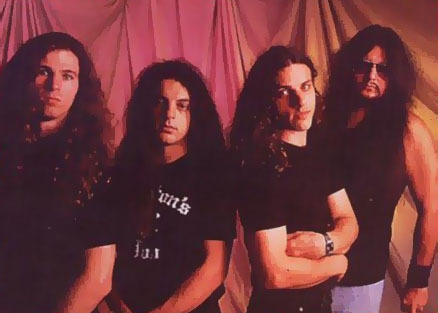 WITH ALL THE TROUBLES WITHIN THE BAND, AS WELL AS THE GERMAN PRESS, IT WASN'T EASY FOR CHUCK SCHULDINER & CO. TO REPAIR THEIR SHATTERED REPUTATION. DUE TO SEVERAL TOUR CANCELATIONS, THEY HAD LOST THEIR CREDIBILITY. FINALLY CHUCK DECIDED TO LET THE MUSIC SPEAK FOR ITSELF, WHICH IS SOMETHING OF WHICH DEATH IS VERY CAPABLE. WITH THEIR LAST DISC "SYMBOLIC" THEY HAVE AN ABSOLUTELY KILLER CD, FULL OF DEAFENING NOISE. I TALKED WITH CHUCK SCHULDINER, A MAN WHO KNOWS WHAT HE'S TALKING ABOUT. Theres a certain magazine that cant really be seen as good friends of Chuck Schuldiner nowadays. Well, I followed that whole history closely and read all the articles about it. No, the subject seems to have been dropped around a year ago. Since then I haven't read anything about your battle. Sounds reasonable. I just wanted to ask because I didnt have any problems with you in the previous interviews and I actually remember you as nice to get on with and a decent conversation partner. I can imagine you still have hard feelings towards this magazine. Do you think that after all the annoyance about the cancelled tours and the stress with the magazine, that the reputation of Death was affected by it? Yeah, thats part of my job. I just try to understand both sides and to maybe give you the opportunity to straighten some things out. Do you believe that the press is too powerful? Did you notice some loss of your reputation on both European tours after the release of Individual Thought Patterns, or were your fans loyal. Despite of all the annoyance, the bands reputation seems to be established. Having its origins in the awesome live shows and the brilliant songs. You can say that despite all criticism DEATH came out stronger, more mature and grew as a band. The question rises how Chuck would describe himself. What kind of human being he is to his opinion. When you shut your eyes for a moment and think about your past, what do you see? As you said before, DEATH as a band has already existed 12 years. It can be said that back then DEATH was one of the founders of a new music style. These years things have changed. A few years ago there was the glorious death metal scene in Tampa/Florida. That disappeared like snow in summer. Did you ever had a chance to be on stage with one of your favorite bands. And good music with DEATH anno 1995 is big, very big. On Symbolic Chuck was supported once more by drum God Gene Hoglan and newbees Bobby Koelble (guitar) and Kelly Conlon (bass). They replaced Steve DiGiorgio (ex-Sadus) and Andy LaRocque (KING DIAMOND). Chuck cant suppress to sound a thousand praises of his fellow musicians and the new producer Jim Morris, co-owner of Morrisound Studios in Tampa. I remember the previous interview when Chuck promised to work again with Scott Burns. After all, he was like the fifth band member. Symbolic is the perfect mix of brutal songs like DEATH just knocked them off in the early years and the more technical, progressive tracks like on the two previous albums Human and Individual Thought Patterns. My favorite piece on Symbolic is Crystal Mountain, yet, what are crystal mountains? They are synonimous for my over critical neighbours, which this song is all about. They believe they live a perfect life in a crystal mountain. Unfortunately, I live next door to this religious fanatics, who live unwordly and certainly not in the just described mountains. Im sorry but those people are not that different from me. They have to pay taxes also and they should not be disturbed by looks like long hair. Although its not religious at all my neighbours are filled with hate and judge me. In this song theres a cross changing into a sword, symbolic for the abuse of their religion. I have nothing against religion in general, but religion should not be directed against others. In Crystal Mountain I expressed my hate and anger towards these people. Its easy to see that Symbolic contains very personal songs, i.e. Empty Words, every day you say things to people that later appear to be empty. Its easy to promise mountains of gold, yet its hard to keep this promise. Spoken words should have a meaning and not just be hollow phrases just being said to be said. You should think about what you want to say and you have to be sure to say what you mean. I hope people can relate to this theme because it definitely is a very personal song."